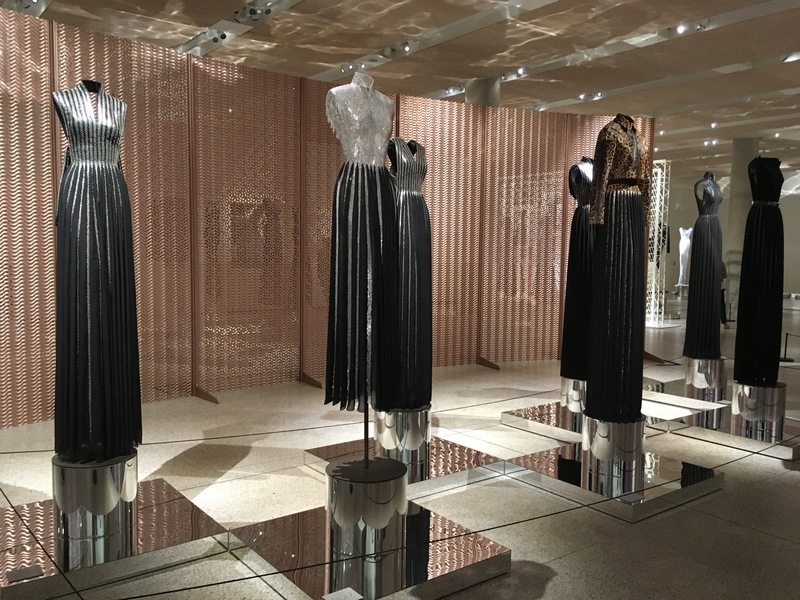 When news broke of Azzedine Alaïa's death in November of last year, it was announced that his final project was co-curating an exhibition of his work at the Design Museum in London. Having opened in May of this year, the exhibition, 'Azzedine Alaïa: The Couturier', showcased a selection of garments by the designer, ranging from the 1980s to 2017. Alaïa's most recent, and final, collection from 2017 is the starting point of the exhibition. Several dresses tower above the visitor, mounted on extremely tall and incredibly thin-waisted 'invisible bodies’ (Fig. 1). These dresses convey the feeling that they were once worn by a tribe of modern warrior women, wearing form-fitting armour of animal-skin and glittering metal. They mark out the central theme of the exhibition, and of Alaïa's work as a whole, embodying his conception of female strength, beauty and sexiness. In a sense, all of Alaïa's designs are made for a tribe of his private clients and favourite models, many of which fit the size that his designs require. However, the extreme height of these garments, further emphasised by being placed on pedestals, make you question the authenticity of the garments on display: were they actually worn or are they an idealised prototype (Fig. 2)? 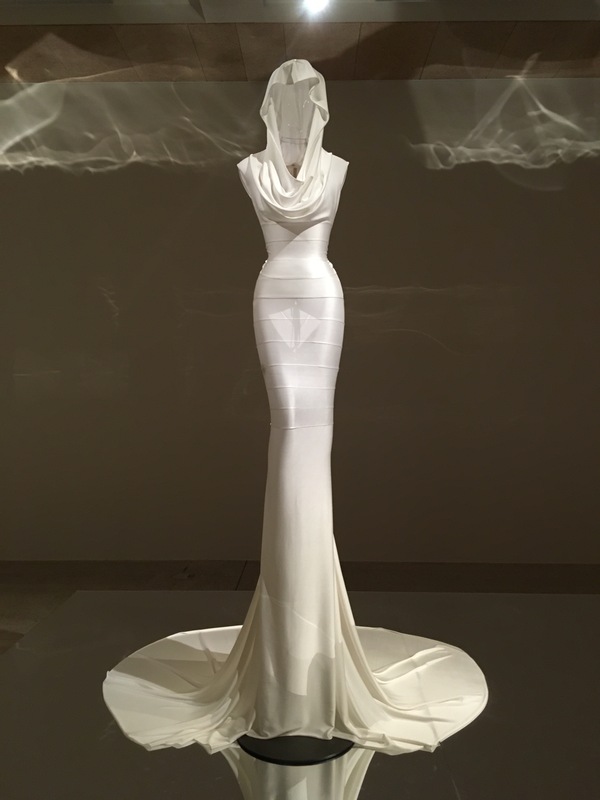 As one would expect from a museum designated to design, the exhibition's focus is on Alaïa's skilled craftsmanship, construction of interesting forms and innovative use of materials. Elements of workmanship, shape and material are reoccurring or juxtaposed throughout the exhibition by the selection of garments. 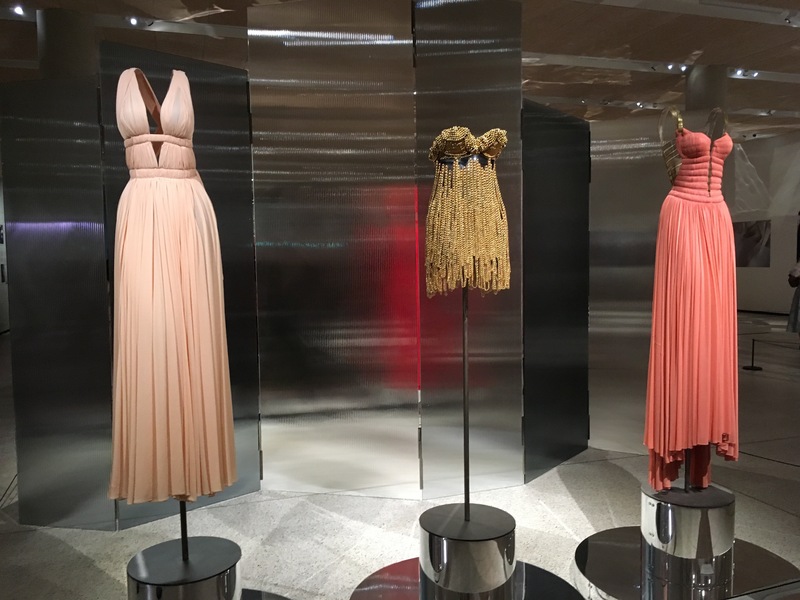 Parallels between his work from different decades are made by placing garments next to one another, such as these three dresses, showing that Alaïa's aesthetic was not bound by time (Fig. 3). Any of the dresses in this exhibition could be worn today and still feel in line with contemporary fashion. 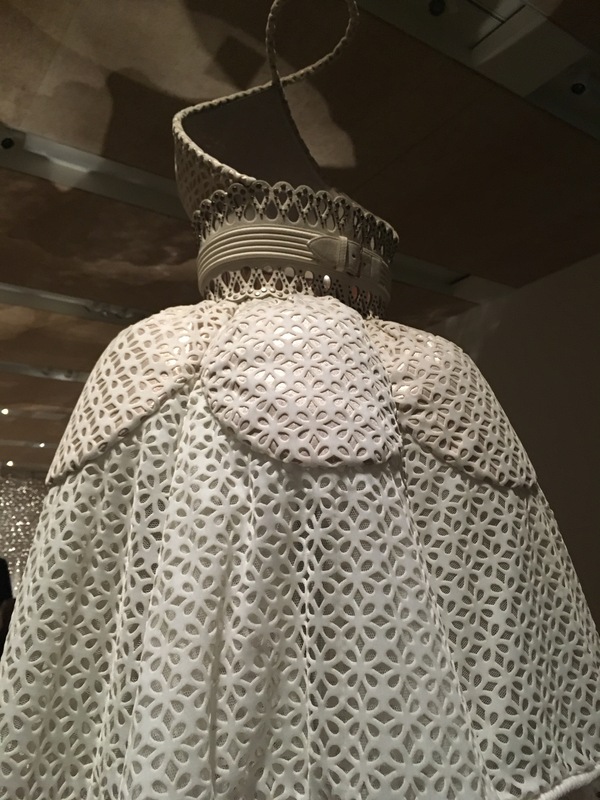 This point was made in another recent exhibition of Alaïa's work in Paris, ‘Je suis couturier’, where the curator omitted dates from the exhibition entirely. 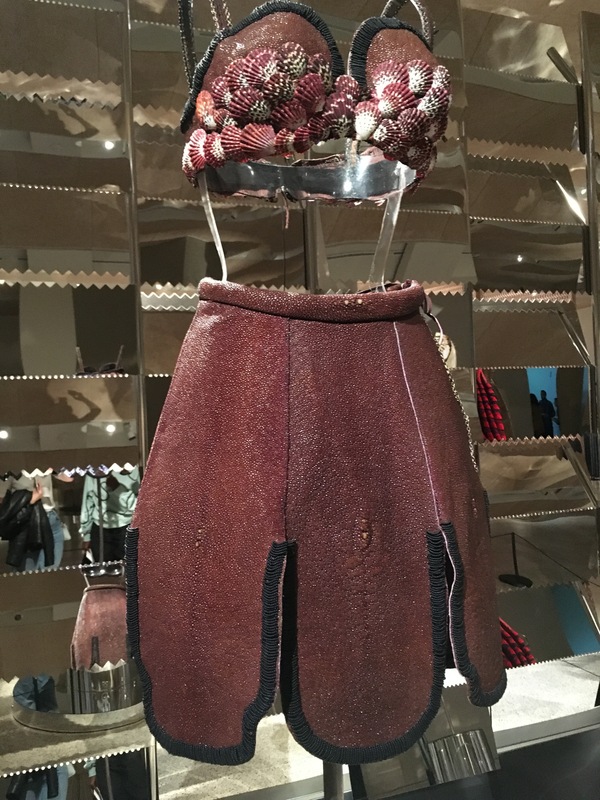 In particular, garments made out of unusual materials such as a skirt and top made from Nile crocodile skin and shells, show that Alaïa's experimentation with materials went beyond stretch-materials and leather (Fig. 4). In addition, voluminous skirts, contrast with his more recognisable pieces that are referred to as ‘second-skin dressing’, pointing to the variety of shapes created by the designer (Fig. 5). Furthermore, photographs placed around the room show glimpses of the reality of making couture inside Maison Alaïa - the skill, the precision, the pinning – that goes into a garment before the final product is made. Without stating it overtly, this exhibition captures and disseminates Azzedine Alaïa's fantasy of women, experimental design tendencies and mastery of couture. Before last year, the name Azzedine Alaïa was less familiar to the mainstream fashion audience. This was probably due to the fact that despite having many celebrity clients, he ignored the collection calendar. However, this exhibition, among others from the past few years, have shed a well-deserved light on the designer. Through this exhibition, visitors can see the garments up close and on the forms they were meant to fit. Thus, the work that goes into creating these garments can be truly appreciated, and the potential of dress-making realised. Dress for an idealized woman?